William Burroughs may have become a figure toward whom many hip musicians gravitated towards in the seventies and eighties, but it remains a rather perverse fact that his enduring influence appears to be stronger in the world of music than in literature. It’s true that many ‘alternative’ musicians and counterculturalists latched onto his lifestyle and biographical details more than his actual output, romanticising the idea of the ‘literary outlaw’ but it would equally be a mistake to underplay the effect his innovations in audio, with his tape recorder experiments extending the concepts surrounding the cut-ups proving hugely influential acts like Cabaret Voltaire and Throbbing Gristle. It’s a shame, then, that so many of the albums which cite Burroughs as an influence are simply dismal. Burroughs may have referenced various ‘poplar tunes’ in his works and resided in Tangiers in the late 1950s but I haven’t yet established any textual basis to connect Burroughs with bad avant jazz or half-arsed hip-hop. 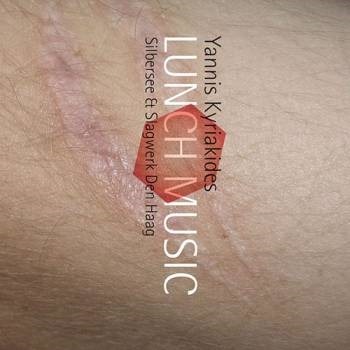 Yannis Kyriakidies and his collaborators are clearly immense fans of Burroughs, and the CD booklet records that the text for the album is not derived from Naked Lunch, but ‘a Burroughsian cut-up of sorts’. Now, this is problematic in that the cut-up technique came later: there are no cut-ups in Naked Lunch, but I would rather be charitable and embrace the spirit of the album: the words were in fact derived from ‘word frequency analyses’ of the book’s segments, and as such, it’s fair to say that the lyrical content very much captures the essence of the book. I can’t help but be impressed by their referencing of Ian MacFadyn’s essay ‘The Mouth Inside: The Voices of Naked Lunch’, and am equally intrigued by the implication that the album was set to be called simply Naked Lunch: Kyriakideas records in his notes that Robert Ashley, to whom the album is dedicated, implored him to use the title and deal with any copyright issues later, but finds the artist conclude ‘somehow I did get scared by the difficulties.’ But what about the music, and what about the delivery? The heavy, heavy crackle of vinyl. Scratched as scratched. From the glitching fuzz or white noise croaks the voice of William Burroughs. Slowed, as if drugged. The sound warps and slows, as if the tape is stretches or the turntable drive belt is slipping. As a barbershop quartet croon Gregorian chants to provide an incongruously jaunty backing, his voice is dragged to an unintelligible drone, slower and slower. Finally, all that remains is a faint whistle, clattering and a thumping beat like a heart’s pulse, which eventually, finally slows… and silence. ‘Boy…. Boys…’ sings an operatic tenor voice against a backdrop of springy instrumentation and whistling analogue on ‘Boy’. The vocal harmonies build in layers, skyward. It might not sound like my impression of Naked Lunch, but that’s a reflection of the book’s multifaceted nature. ‘Shakin’’ takes Johnny Kid and the Pirates’ hit and jars and stutters it, one more scratched CD, bowed LP, cassette tape chewed in the machine heads. From the sonic swamp into which the song rapidly descends emerge crawing pterodactyl-like sounds. Like Burroughs’ fragmented, fevered narratives, so the pieces of music are twisted and contorted out of shape, linearity dispensed with in favour of atmosphere and heightened sensation. Kyriakides returns to the barrelling scrape of badly worn vinyl on ‘Junk World’, while industrial scraping and a babble of voices in multiple languages combine to disorientating effect on ‘Like replicas’, before ‘Speed Days’ moves into the kind of musical territory more commonly associated with Burroughs-related recordings and tributes, with scratching and rattling industrial percussion. In all, it’s something of a mixed bag, and while I personally don’t love all of the music, I have to admire its spirit.